All Motors are 2019 year models. All Tohatsu Outboards Have a FIVE Year Warranty! Backwoods Landing is now "advertising" our small Tohatsu Outboards (20hp and smaller) at MAP (Minimum Advertised Price) To our valued customers, please call for our latest motor discounts. Nobody beats our price. For example take our Weldbilt 1448-F for $1630 and our Backwoods trailer for $999 and a 9.8hp Tohatsu with electric start and the rig price would be $4678. The prices on the 25hp and larger are as good as it gets. Check the competition. For these prices you get a fuel tank, prop, fuel line, oil, free installation, Free STEERING on our boats, and a free full inspection before it leaves our shop. Most everyone else charges you for all of these extras that we give you for FREE! 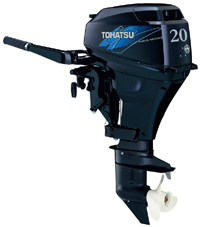 Tohatsu is the largest outboard manufacturer in the world! They make over half of the small motors on the water for multiple companies. Why pay the higher price for a so called "name brand" when it is built by Tohatsu. They are one of the best and most reliable engines on the water. If you don't believe me do your research. 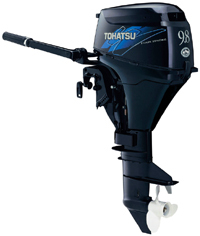 All Tohatsu TLDI , 25 and larger 4-stroke engines require setup and checkout at BackWoods Landing.